Every home needs to be deep cleaned periodically. No matter how good you are about keeping up with regular cleaning and organizing tasks, you'll need to set aside time every once in a while to do a very thorough cleaning of those hard-to-reach areas and take care of cleaning and maintenance tasks that don't need to be performed frequently. Since the areas that you'll need to tackle when it's time for deep cleaning are the ones that you don't necessarily see all the time, working with a checklist is a great way to make sure that you're taking care of everything that needs to be handled. 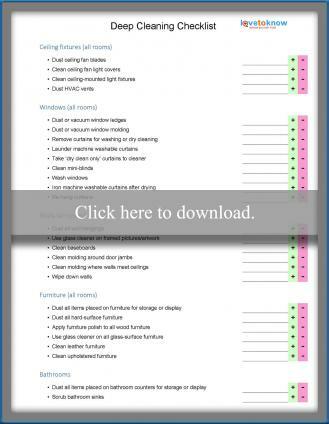 To use the free printable checklist provided here, simply click the image to download it as a customizable PDF document. Once the file is open, you can print it, or save it to your computer, cloud storage or external storage device for future reference. You can also add and remove items from the list to meet your specific needs using the '+' and '-' symbols at the end of each row. Let the checklist be your guide as you work your way through the house, marking off each task as you go. This will help you track your progress and stay aware of exactly what you have left to do. 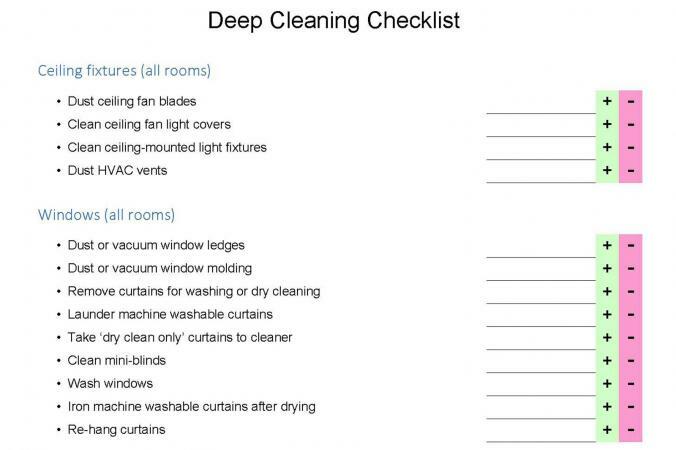 Download a checklist for deep cleaning. Your efforts will go faster and more smoothly if you don't let too much dirt and dust build up in between deep cleaning sessions. Use a weekly checklist for housecleaning and a household chore list to keep up with tasks that should be performed more frequently - that will minimize the difficulty of your periodic deep cleaning tasks.